Neeraja will eat anything once. Or maybe twice. She is a Post Graduate in Economics from Mumbai University. 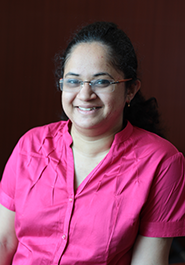 At Aureus, Neeraja is a part of the data sciences team, and is responsible for developing statistical models for products. When she is not busy cracking a data science challenge, Neeraja is busy solving all the Rubik cubes in the office.